Falls Church Farmers Market, ARMN, and the Environment Team: Good for the Body and the Environment! A dedicated group of members from ARMN and the Falls Church Environment Team have braved all types of weather over the past several years with their informational display at the Falls Church Farmer’s Market. ARMN members Kent Taylor and Toni Genberg have led the weekly effort on Saturday mornings, and change their messages throughout the course of the year. Photos courtesy of Kent Taylor unless otherwise noted. The Falls Church Farmers Market has been a go-to location for everything from Artisan cheeses to Zinnias since 1984. In addition to the edible goodies, plants, and specialty items, there are a number of information booths worth a visit, too. From October through April, ARMN manages its own booth and from May through September, it shares a booth with the Falls Church Environment Team. This booth includes representatives from the Fairfax Master Naturalists, Fairfax Master Gardeners, Falls Church Habitat Restoration, and Green Spring Master Gardeners, and also provides local green information from the Falls Church Environment Web. Falls Church Environment Team Booth and visitors. And yes, we have answers, literature, and other resources to address all of these! Some of the many topics addressed at the Falls Church Environment Team Booth. We’ve given away seeds, and trees. We’ve helped with Eagle Scout projects, and solar campaigns. 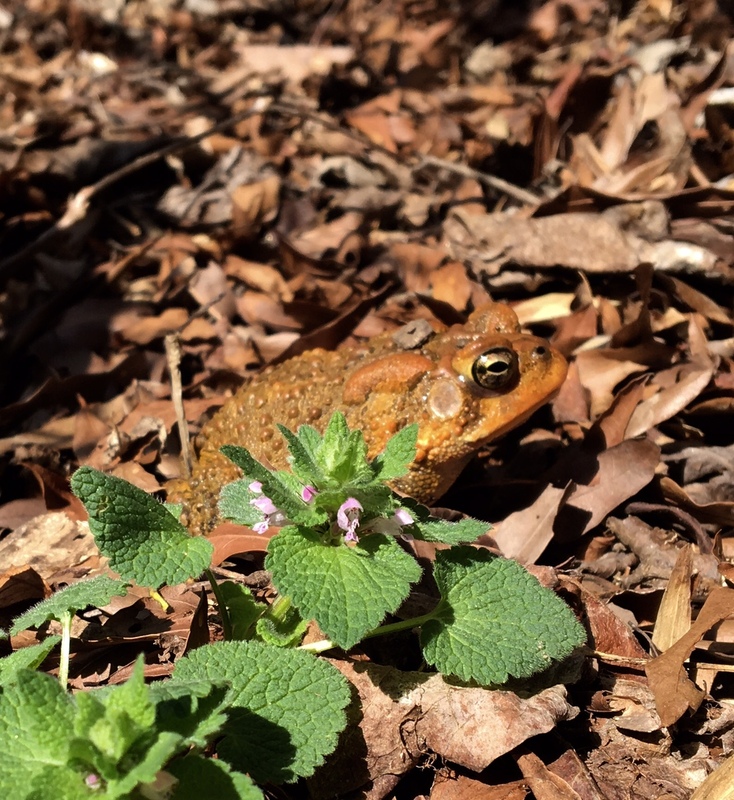 We’ve also helped the City of Falls Church gain recognition as a Certified Community Wildlife Habitat community by the National Wildlife Federation. 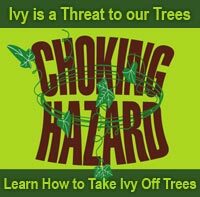 ARMN has an ongoing Choking Hazards campaign that educates people about the strangling dangers of English Ivy on trees. Falls Church Environment Team member, Toni Genberg, simplified the Choking Hazard message with a simple question for market goers: “Did you know? English Ivy will choke & kill any tree it climbs.” The message surprised lots of visitors and started a conversation. The Saturday before this past Halloween, Toni collected some English ivy and printed Halloween-ish signs, which were a good draw to visitors to the market. There were lots of questions on mulch and pruning. It was a good day! Kent Taylor at the 2016 Halloween-themed booth. Photo courtesy of Toni Genberg. Toni Genberg braving the cold to share information with booth visitors. I really have to give a lot of credit to Toni who is still fighting for the plants and animals around us, even on chilly days in the middle of winter. Two women were so inspired by our information that they said they were going to enroll in the next ARMN Basic Training. Someone else said they would stop using pesticides. And another person asked where they could pull invasives. These are baby steps, but baby steps can add up! The Falls Church Farmers Market operates year around. The hours from January through March are 9 am–noon, and hours from April through December are 8 am–noon. Come to the Market and visit the ARMN booth in the colder months and the Environment Team in the summer. You’ll be sure to be inspired, too! 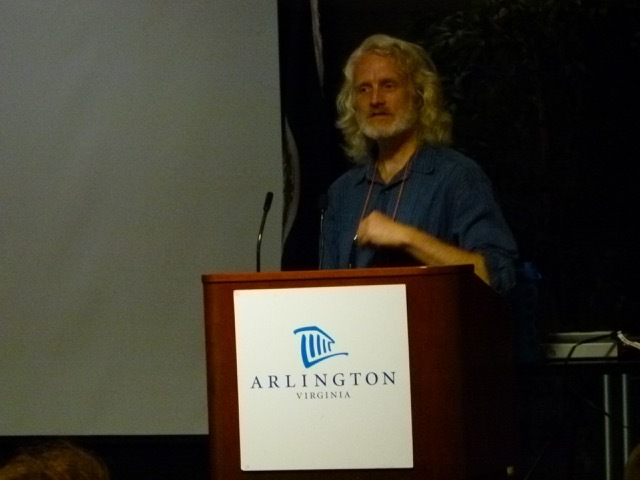 Sam Droege, a scientist at the Patuxent Wildlife Research Center, entertained and educated ARMN volunteers and members of the public on May 11 in a talk at the Arlington Central Library. 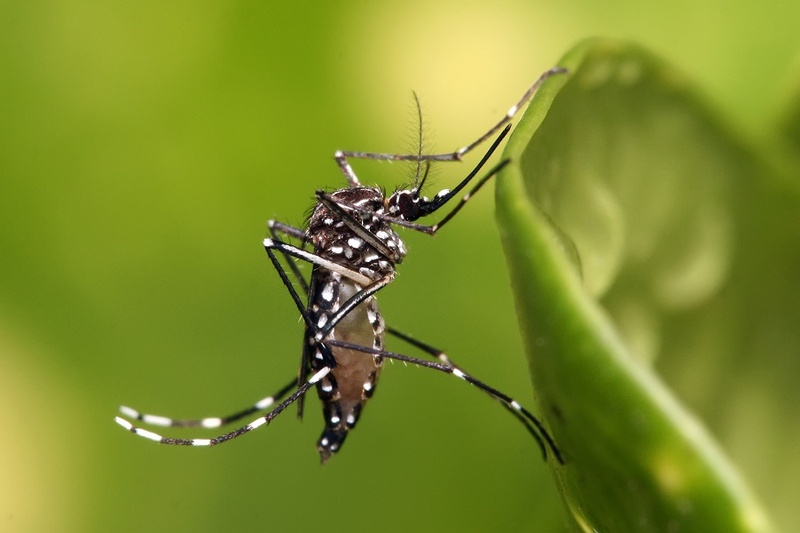 Droege works on the design and development of status and trends data for U.S. plants and animals. Currently, he is swept up in surveys for native bees. 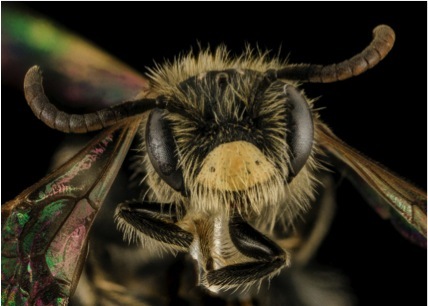 Droege shared research from a soon-to-be-published paper he co-authored with Jarrod Fowler that lists plant genera and the native specialist bees that need them. He explained that specialist bees have more finicky needs than generalist species. Generalist bees are out all season, have higher population levels, and can handle disturbed sites. In contrast, specialist bees are out for an average of five weeks, have lower overall population levels, and are good indicators of quality habitat. Of the bees that carry pollen (not all do––parasitic bees, for example,) specialist bees feed their young from a limited range of one to three plant genera. 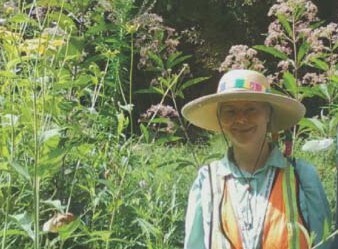 Native bee specialists tend to visit perennial plants commonly found in vernal woodlands (ephemerals), summer composite communities, and ericaceous (plants in a family that includes blueberries) heaths. Sam Droege at Arlington Central Library. Photo by Suzanne Dingwell. Droege dazzled the audience with photographs of flowers and the bees that frequent them, describing their interactions. In response to a question about cultivars, Droege said that initial research performed at the Mt. 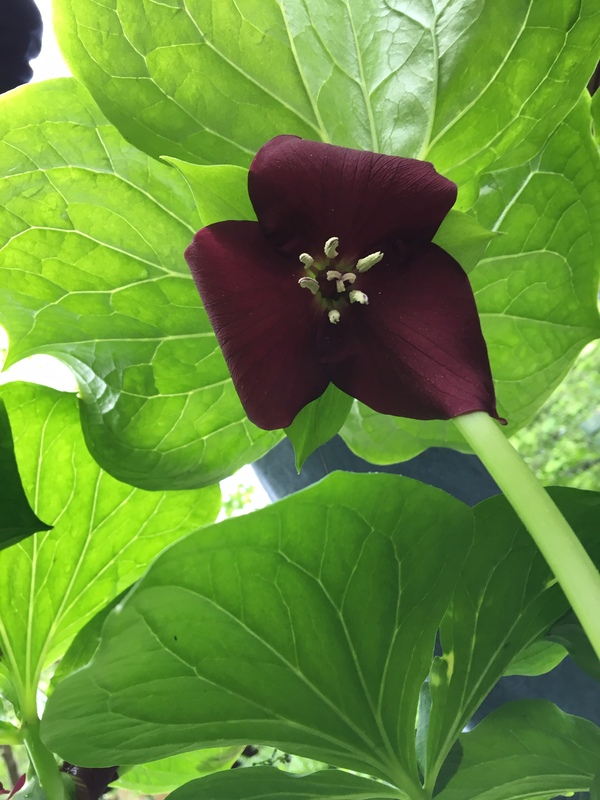 Cuba Center, a horticultural institution in northern Delaware, and by the New England Wild Flower Society shows that cultivars are less attractive to bees. However, planting native species is a known benefit to native bees. Droege and Fowler’s paper includes a list of plants that native bee specialists find particularly appealing. 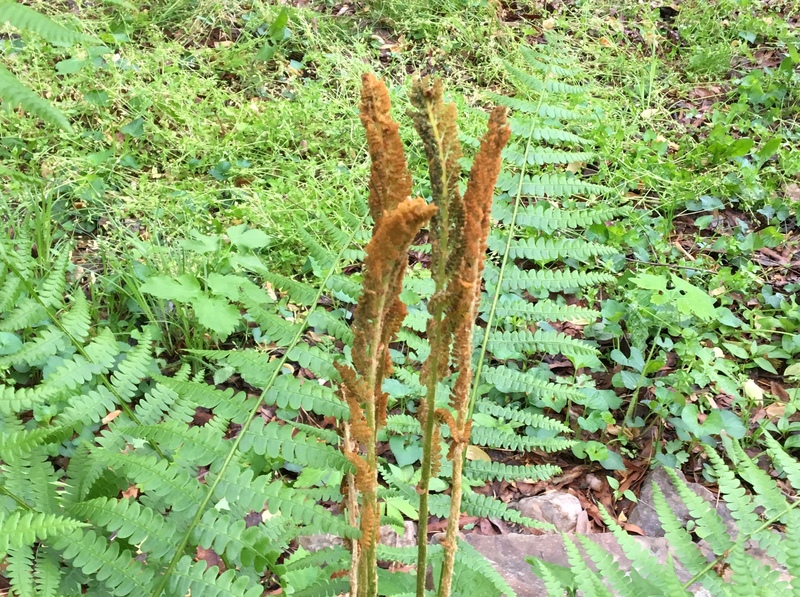 The list includes a number of native plants that are not commonly planted in local yards. Droege encouraged the audience to consider planting some of these species to support the bees that need them. 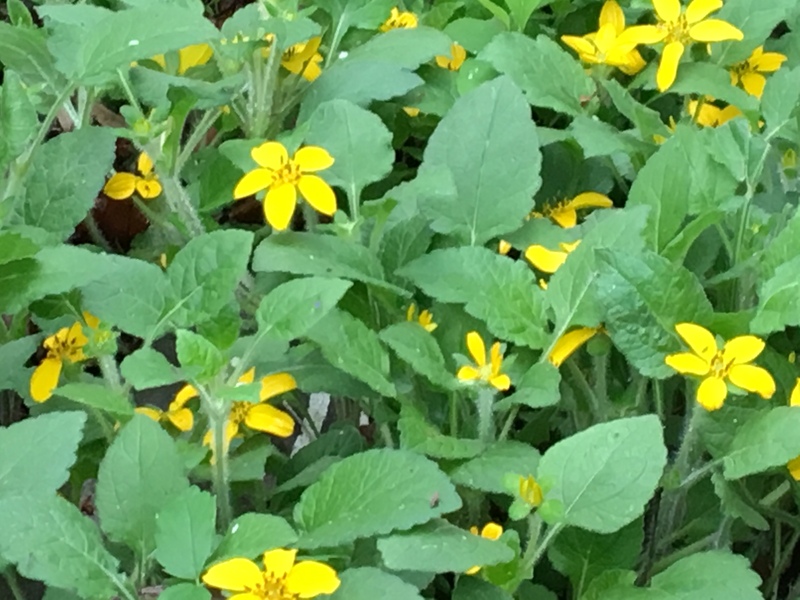 The following table lists genera and common names for a host of native plants that thrive in our area. Most of them should be available from the Earth Sangha plant nursery in Springfield (www.earthsangha.org) or from the Potowmack Chapter of the Virginia Native Plant Society at Green Spring Gardens in Alexandria (www.vnps-pot.org). Planting species that native bees depend on is one important strategy to help save these important pollinators. Another is to provide patches of bare ground for ground-nesting bees. These kinds of measures, when practiced widely by homeowners and caretakers of community landscapes, go a long way toward ensuring the continued––and critical–– presence of native bees in our ecosystems. Stumpy, Long Branch Nature Center’s three-legged eastern box turtle, is one of only a few wildlife rescues at Arlington County nature centers that have been given individual names. Most animals on exhibit answer to generic monikers, such as Ms. Owl or Mr. Ratsnake. This is to remind people that the resident animals are not pets, but belong in nature, whether or not they will ever be able to return to their natural habitats. Stumpy, however, is a special case, as he would be the first to tell you. In advance of the annual Turtle Trot fundraiser on Saturday, May 17, at Lower Bluemont Park, a volunteer with the Arlington County Master Naturalists (ARMN) visited Stumpy at his residence at Long Branch to get his take on life and the importance of the Turtle Trot. 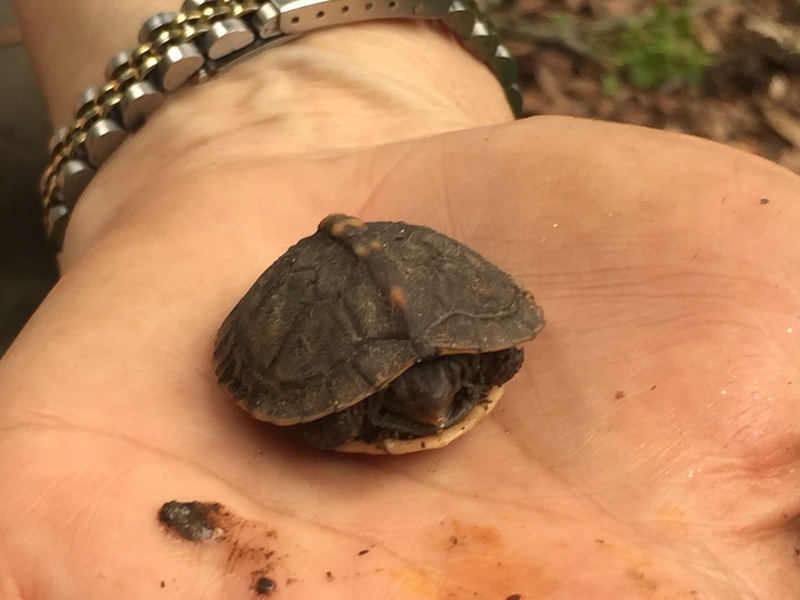 As the interviewer was not fluent in box turtle (well, at least not in the eastern dialect), Amanda DuPrey, a Long Branch staff naturalist, assisted with the translation. ARMN: You’re an eastern box turtle, Stumpy. I notice that you’re not in a pond habitat like some other turtles at Long Branch. 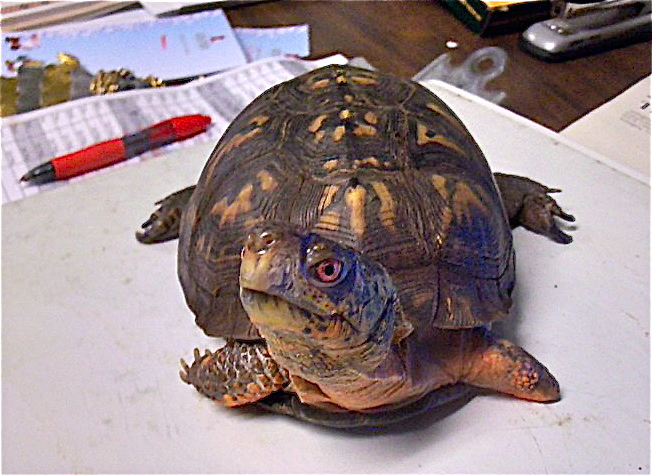 Can you tell us something about box turtles and their lifestyle? Stumpy: Everyone thinks that turtles belong in the water, but I much prefer the terrestrial life. In my opinion, the grub is much better. 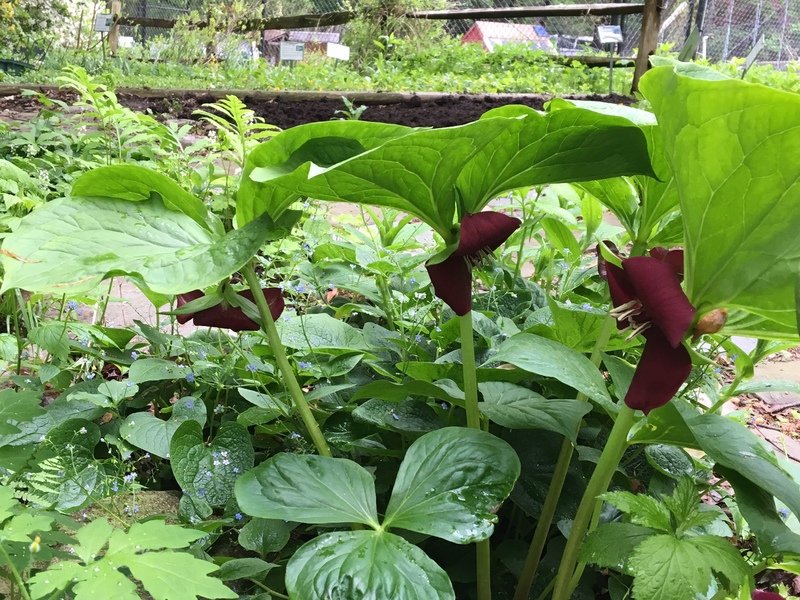 Worms, mushrooms, insects––oh, my! I’m drooling at the thought of a worm. There is really so much to say about turtles. We are great! Turtles are one of nature’s longest-lived creatures. I take pride in my long life span and leisurely lifestyle. I’m hoping to break that record of 138 years old. I say, 140 years old or bust! Part of the reason we live so long is because we don’t have a lot of enemies. Our shells keep us well protected and we can close ourselves up just like a box when we are scared or in danger. 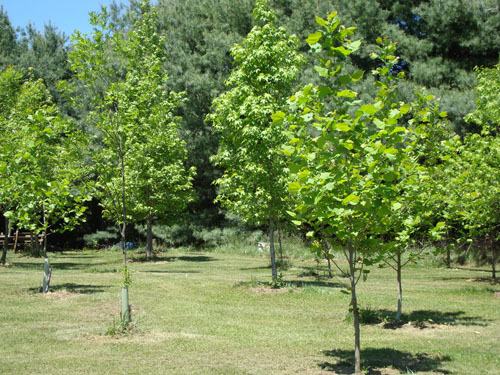 YOU have a great opportunity to get native canopy trees planted in your Arlington neighborhood – last year the Tree Canopy Fund got 515 trees planted, including 61 Nyssa sylvatica, 110 Quercus species, and 45 Betula nigras! All of the information you need to start planning is on the ACE website at the link below. It is a group application – you’ll have to recruit in your neighborhood, church or temple, or just your block.